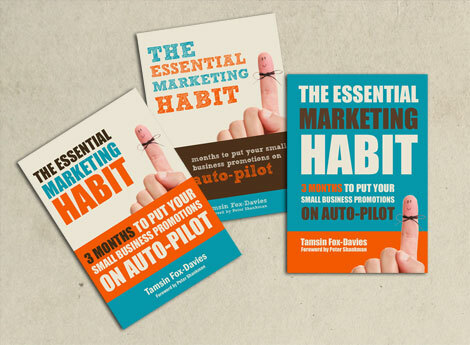 3 book cover design options – and a vote on Facebook! Normally when we work with clients on designs we show then 3 different designs and then tweak them according to their feedback. We end up with a more or less final design which our clients can take back to any other decision makers in their companies and get a final design decision. Or, the client decides which design they would like within the first design presentation meeting. With Tamsin’s book cover, we started off in a similar way. We got a comprehensive brief from Tamsin – including Tamsin’s typography preferences, the idea of the string around a happy finger, and a colour scheme which Tamsin had done by our client, colour psychologist, colour blogger and interior designer Karen Haller!. Then with this information Amy worked on 5-6 initial ideas. Tamsin came to our office (on a Saturday!) and sat with me and we combined elements, tried different colour combinations, moved things around and kept comparing and eliminating options until we had not one final but 3 final different ideas! And here comes the crucial difference. In the name of market research, or social media and of “walking the walk” we then posted these on Facebook and created a Facebook poll. We each asked our facebook friends and fans to VOTE for their favourite. The responses and comments have been so helpful! We also each tweeted on Twitter and updated LinkedIn to ask people to vote. And we are asking again at different times to get the message to different people. And now we need your vote too! Would you help out? Click on the link to Tamsin’s Facebook wall and vote for which of the 3 designn you like – feel free to comment on the designs in general. Vote now for your favourite of the 3. We hope you like our experiment and – and just want to say THANK YOU – for your time and your vote! Comments below welcome as well! I like the first or the third but If I had to judge one book from its cover I would get the first. I couldn’t decide so I voted for 1 and 3! 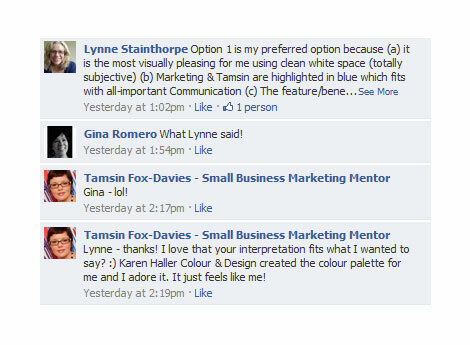 Tamsin is a very valued client of mine and it was a pleasure to work with her on her company’s branding colours and seeing it applied across all her on and offline marketing and products. Can’t wait to see which one cover is picked. i say the right-hand one, but invert the text so that ‘Marketing’ is in white & is the stand-out word? First one for me! It is the most visually striking. Great to hear that book cover 3 was picked! Definitely eye catching. Number three. It’s the first one that caught my eye.